Wuxi Graphene Film, a wholly-owned subsidiary of The Sixth Elements Materials, has launched a new graphene-enhanced product in the Chinese market: The GF1 Graphene Watch. 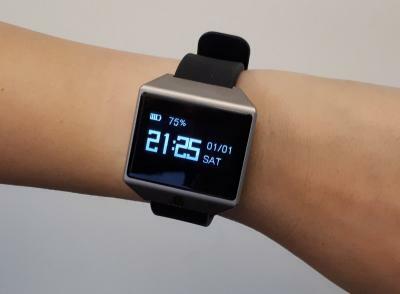 It is a smart health watch, with CVD graphene film acting as the conductive element for the touch screen (as a replacement for the usually-used ITO). The Company kindly sent us one of these new watches to try out. So thanks! and here are our impressions: First of all, it is an attractive-looking watch, with a futuristic design and a quality feel to it. The display is a 1.3'' monochrome white OLED with a 128X64 resolution. The watch comes with an accompanying app, and includes features like pulse and heart rate monitoring, step meter, sleep quality tracking and more. The graphene-enhanced watch is already shipping in China through JD, and sells for ¥489, which are around $75 USD. It is also shipping in the US via Amazon for $55 (disclose: this is an affiliate link to Amazon). Overall, we felt the watch worked well, responded promptly and was pleasant to use. It is great to see one of the first commercial CVD graphene applications! Looking forward to seeing more of these. If anyone is interested in buying this watch and testing the graphene touch screen, please contact us.